Government Polytechnic College, Sundernagar, has suspended two students who ragged their junior, inflicting multiple injuries. He is in a state of shock. After previous year’s extraordinary performance when hydropower projects achieved a record generation, the power sector hit a low in 2012 with a sharp fall in generation and the fund-starved state electricity board plunging deeper into a debt trap. The Green Bench of the HP High Court dominated the environment issues in 2012 on the eve of the state Assembly elections that put the ruling BJP and the Congress in a heated blame game. The 12th Five-Year Plan budget of the state has been fixed at Rs 22,800 crore, which is 65 per cent higher than the previous Plan. The Plan was finalised at the meeting of the National Development Council (NDC) in New Delhi today. CPI and CPM activists staged a protest at the Zonal Hospital here today. They demanded that vacant posts, particularly of specialists, be filled. Former Chief Minister PK Dhumal will shift from Oakover, the official residence of the Chief Minister, to Krishtan Hall. Chief Minister Virbhadra Singh paid him a courtesy call yesterday. Virbhadra Singh meets PK Dhumal at Oakover in Shimla on Wednesday. After the defeat of BJP MLA Baldev Sharma from Badsar constituency, the block unit of the BJP has expelled eight party workers from the primary membership of the party. The intense cold wave sweeping the upper Kullu valley tightened its grip further as upper Manali areas and the higher reaches received a fresh spell of snow today while lower areas were lashed by rain. Sepoy Rakesh Kumar (30) of the 37 Rashtriya Rifles posted at the Mendhar sector in the Rajouri area of Jammu and Kashmir has attained martyrdom as a bullet fired by terrorists hit him in his chest. He had killed two of them during the encounter. The 108 Emergency Medical Service handles a critical emergency every sixth hour to save a life and its staff on board delivered 1,700 babies over two years since its launch from December 25, 2010. A two-day annual cultural function (Abhivayakti), being organised by the Central Students Association (SCA) of Netaji Subhash Chander Bose Memorial Postgraduate College, Hamirpur, began here yesterday. Two cattle were burnt alive and three families rendered homeless as fire broke out in Majhach village near here this morning. No loss of life was reported. The families could not save their household goods. 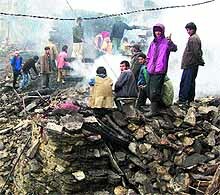 According to Manali Subdivisional Magistrate Balbir Thakur, the total loss was estimated at Rs 30 lakh. The three-and-a-half-storey house was reduced to ashes, he said. The police has arrested two car-borne youths, Pankaj soni, a goldsmith, and Pankaj Sharma of Sunhani, near here, with a box containing 60 bottles of Corex without any valid documents. Two persons were arrested following the seizure of 105 wooden logs at a naka near Tanda late last night. The logs seized from their possession were being carried in a truck to Punjab from Parore, the police said here today. Dr Sudha Sharma, Member, Central Board of Direct Taxes (CBDT), inaugurated the Ayakar Sewa Kendra (ASK) here yesterday. Kamal Sharma and Rakesh Sharma were appointed Special Secretaries in the Chief Minister’s Office today. The state government yesterday appointed Balbir Tegta, Secretary, Animal Husbandry, as the Secretary of the Vidhan Sabha on deputation. He replaced Govardhan Singh who has relinquished charge. The victim was brought to Sundernagar by the police from Kharar as he had left his room after the incident on December 23. The Kharar police found the boy in a mentally unstable condition and intimated the HP Police about the same. The victim’s medical examination at civil hospital, Sundernagar, has revealed that he had suffered multiple injuries on his private parts and was in a mental trauma. “We have no psychiatric department here, hence the patient was referred to the IGMC, Shimla”, said Dr M Javed, senior medical officer. The police did not reveal the names of the victim and the accused as they were all juveniles. The duo was produced before the Juvenile Board that sent them in custody of their father. The victim was a first-year course student at the college. The victim also failed to take up his final examination today. They used to stay in separate paying guest accommodations in Sundernagar. None of these accommodations is registered with the college. SP, Mandi, Abhishek Dular said the boy stated that he was locked in his room and was beaten up by the accused. Vinita Arya, Principal of the college, said they have suspended the two students. Revenue from the sale of power declined despite the increased quantum-free power available with the commissioning of the 231 Chamera III project and some private projects due to a slump in the market. Revenue was likely to touch Rs 1,000 crore though free power available for sale increased from 3,600 million units (MU) to over 400 MU. The financial woes of the board multiplied due to the increasing debt burden. The state did not receive the arrears in accordance with the Supreme Court verdict upholding the state’s claim of 7.19 per cent share in BBMB projects. The amount has been worked out to Rs 4,250 crore and the new government will have to pursue the matter. The power generation from hydropower projects declined sharply due to unfavourable weather conditions. The country’s largest Nathpa Jhakri hydroelectric project, which generated a record 7,610 MU last year, is not likely to achieve even the MoU target of 7,000 MU in 2012. The project has till date generated only 6,137 MU as compared to 6,945 units in the corresponding period last year. The generation is already short of the target by 160 MU. No new major power project was commissioned by the board. The 100-MW Uhl project could not completed by the end of 2012 as targeted and it will now be commissioned only in 2014 as per the revised schedule. The cost of the project has more than doubled to over Rs 11 crore making it the costliest big project till date with an average cost of Rs 11 crore per MW as against the normal Rs 7 crore to Rs 8 crore per MW. The poor financial health of the board has started affecting the maintenance of power infrastructure as a result of which there were frequent breakdowns, particularly in the Baddi-Barotiwala-Nalagarh area where most of the industries were concentrated. The power supply was being disrupted due to overloading elsewhere too as the board has failed to upgrade the infrastructure to cater to the increasing demand. With the total debt exceeding Rs 4,200 crore, including short term loans and the accumulated losses crossing the Rs 1,450- crore mark, the board plunged into a serious financial crisis. Concerned about their future, particularly pension and other retirement benefits, employees continued to agitate throughout the year demanding a bail-out package on the ground that the board had suffered losses because of government policies. They demanded that a part of the arrears from BBMB projects be utilised to constitute a pension fund. The implementation of revised pay scale had sharply increased the employee cost from Rs 650 crore to about Rs 1,100 crore over the three-year period. The board is now pinning its hope on the bail-out package announced by the Centre that could help it bring down its loan liability by about 50 per cent. The state will have to own up about Rs 700 crore of loan by issuing bonds and the remaining Rs 700 crore will be rescheduled by banks with a moratorium of three years. Thus, much will depend on the government whether it is willing or not to take over the liability. A decision has to be taken before December 31. Other conditions like increasing tariff annually and bringing down the commercial and technical losses by 1.5 per cent every year are not difficult for the board to fulfil. The government got the World Bank nod to fund US $200-million Environmentally Sustainable Development Policy Programme (ESDPL) to meet its challenges in agriculture, hydropower, industries and tourism. This raised the ire of experts and NGOs on the ground that the “loan will plunge the state into an already burgeoning debt trap just because of its inadequacies and mismanagement”. Villagers demanded their inclusion from wildlife sanctuaries and the implementation of the Forest Dwellers Rights Act, 2006, in all 12 districts and restoration of traditional rights in wildlife and national park areas of the state. The major highlight was that the Green Bench imposed a fine of Rs 100 crore on the JP Group for starting its cement plant at Nalagarh and passed strictures on the government functioning. The Him Parivesh, Nalagarh, and the Sundernagar Sangharsh Samiti and other NGOs won the battle in the high court after a Green Bench rejected the environment clearance given to cement companies without public hearing. The Vigilance probe on the Nalagarh cement plant is still on and the issue of Sundernagar cement plant is in the Supreme Court. The Green Bench froze the construction in the Rohtang area to stop the concrete and traffic mess being created in the hills of Manali. The state has failed to put in place its environment policy. The outgoing government had announced to make Himachal a “carbon-neutral state”, a fashionable new environmental jargon, by 2020, a first state to do so in the country. But nothing concrete happened on the ground. 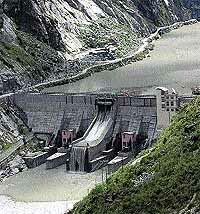 Ecology in Parbati, Sainj, Wangtu-Karcham, Pabbar, Churah-Chamba valleys are in tatters due to the construction of hydropower projects. From Kufri to the Rohtang Pass, most tourist spots stink of horse dung and reek of trash and junk. The Beas, Sutlej, Ravi, Chenab rivers and their tributaries continue to flow with the trash and junk, sewage released by nearby towns and project construction debris across the state. Villagers around the cement plant at Barmana demanded to shift from the place. The cement plant remains a constant source of dust, noise and environmental pollution for local residents. Cement plants destroy water sources, raise dust and nano-particle emissions from these are constant life-threatening hazards. This dust enters houses and is inhaled by residents and it causes ailments like asthma, bronchitis, skin allergies and cancer. The dust and finer cement and coal emission has also destroyed crops. Cement plants employ 1,268 persons directly. The government earns Rs 41 crore as road tax from these plants and about Rs 91 crore as royalty from a big plant annually. But the cement cartel has been prevailing upon the state government as the companies have refused to decrease cement rates in the state, which continue to get the costliest cement. The theme “Protecting the Global Commons: 20 years Post Rio”, was organised by The Energy and Resource Institute (TERI) headed by environmentalist RK Pachauri. The government has aimed to generate Rs 20 crore as revenue for 20 years under biocarbon projects in 177 panchayats in 10 districts of the state. It created environment fund through voluntary contributions from individuals and organisations for environment protection. On paper, the government has planned to cut down carbon emission with departments to carry out their energy and environment audits to redirect its actions. It started a mission, “Community-Led Assessment, Awareness, Advocacy and Action Programme” for environment protection and carbon neutrality at the panchayat level. It covered 250 panchayats out of the 1,000 it had aimed initially and launched the CFL Bulbs Scheme. But it could not sustain the scheme as its disposal was creating environment issue in state. Chief Minister Virbhadra Singh said the state government had set the target of a growth rate of 9 per cent compared to the national average of 8.2 per cent. The Chief Minister sought a separate strategy for the development of northern hill states like the North-Eastern states. “The Centre should enhance budgetary support to all special category states alike and provide a uniform funding pattern in the ratio of 90:10 to all special category states,” he asserted. He urged the Centre to compensate Himalayan states for conserving ecology. “Himachal Pradesh will review its forest policy to ensure that natural resources are not overexploited and the livelihood of those who depend on forest resources are not adversely affected,” he said. Virbhadra Singh urged the Centre to restore air traffic to the state and promote tourism by providing subsidy on heli-taxi service on the pattern of North-Eastern states. “The Centre should help Himachal Pradesh by providing liberal financial assistance for the expansion and upgrade of the existing civil aviation infrastructure,” he said. He insisted on the continuation of the subsidy on liquefied petroleum gas cylinders due to the higher fuel requirement in high-altitude areas. In the absence of subsidy, the demand for fuelwood would increase, leading to extra pressure on forest wealth, he said. He urged the Centre to declare the Baddi-Kalka and Bilaspur-Manali-Leh rail line projects as those of national importance. He also sought the early completion of the Nangal-Talwara and Bhanupalli-Bilaspur-Beri rail line projects by allocating adequate budgetary funds. He urged the Centre to delegate the power of environmental clearance to the state government so that power generation projects in the state could be expedited. He said an additional 4,630 MW of hydro power of the total potential of 23,000 MW would be generated in the state during the Plan period. He requested the Centre to revive the industrial package to Himachal Pradesh and suggested that hilly and backward areas of neighbouring states could be included in it on the basis of tough geographical conditions. He said the state government would construct about 7,500 kilometres of new roads during the Plan period to connect all villages with a population of more than 100. He added that about 2,000 kilometres of national highways would be constructed and proper maintenance of the existing road network would be undertaken. The Chief Minister urged the Centre to assist Himachal Pradesh in setting up food processing industries. He also urged it to increase the import duty on imported apple thrice to safeguard the interests of fruit growers in the state. The protesters raised slogans again the government and expressed the hope that the new regime would meet the demand of residents. The hospital needed a surgeon, gynaecologists and physicians, they added. Health officials claimed that there was no rule on the number of posts at Zonal Hospitals. The activists claimed that more than 17 posts of doctor in this hospital were lying vacant. CPM general secretary Bhupender Singh said people of the region were not getting enough doctors. There were select specialists at the hospital and patients were being forced to take costly treatment at private hospitals, he added. CPI leader Desraj claimed that the state government was not spending enough on the heath sector. Services were being outsourced to private parties, he added. Virbhadra Singh told Dhumal that he could stay put at Oakover as the former had his own private residence in Shimla. Dhumal said the house belonged to the Chief Minister and he would vacate it immediately. The government promptly allotted Krishtan Hall, currently occupied by former Public Works Department Minister Gulab Singh, to Dhumal. The two leaders exchanged pleasantries during the meeting. Dhumal congratulated Virbhadra on his electoral victory and taking over as the Chief Minister for the sixth time. During his previous terms, Virbhadra had stayed at Holly Lodge, his private residence, and Oakover was used only for meeting people. Three times MLA, Baldev Sharma, lost in the elections by 2,658 votes at the hands of a new Congress candidate, Inder Dutt Lakhanpal. BJP MLA, Baldev Sharma, had since been blaming a section of the BJP for allegedly sabotaging his victory in the election. Those expelled from the BJP include Pratap Singh of Kohla village, Nikka Ram of Sathvein, Mahila unit of the BJP leader, Sushila Sharma, former block media in-charge, Nanak Chand, Suresh Kumar of village Thakru and Sanjeev Kumar of Budhan village. This brought the day and night temperatures down drastically. The upper Manali region was enveloped with fresh snowfall this afternoon. Icy winds blew throughout the day. Tourists who had come to Kullu and Manali to celebrate the new year were surprised to see upper areas covered with fresh snowfall. Hundreds of tourists rushed to the Solang valley, Kothi and Gulaba. Reports said the incident occurred on Monday night. Rakesh was rushed to the nearby Army Medical post and later to a hospital, but later he succumbed to his injuries. Rakesh Kumar, son of Nathu Ram, hailed from Behran village, near Barthin, near Ghumarwin. His body is expected to arrive at his village shortly. In all, 2,49,146 emergencies were handled over the period out of which 42,603 were related to pregnancies. In fact, the paramedical staff deployed in ambulances delivered a baby every eleventh hour and an ambulance was dispatched every fifth minute. The maximum number of 41,234 cases were handled in Kangra district, followed by Shimla (38,042), Mandi (33,680), Sirmaur (25,340), Chamba (21,232), Hamirpur (20,316) Bilaspur (19,785) and Solan (19,607). Maximum 12,607 medical emergencies pertained to accident cases, followed by respiratory distress (12,463) and cardiac problem (10,456). Besides, there were 9,280 police-related emergencies. The ambulance service operated by the GVK EMRI, a nodal agency of the state government, in the public-private-partnership mode caters to the police, fire and medical emergencies 24X7 across the state accessible through the toll free number 108. Head of operations, GVK EMRI, Himachal, Mehul Sukumaran said the service was playing an important role in improving the health care facilities by providing prompt help to victims. The service had revolutionised the emergency pre-hospital care scenario in the state. Students participate in a fashion show during the annual cultural function in Hamirpur on Wednesday. Senior college teacher Dr Nalini Kaushal was the chief guest at yesterday’s function. Students of the college presented items on the first day that included a quiz competition, declamation contest, skit competition and a fashion show. Two cattle were burnt alive and three families rendered homeless as fire broke out in Majhach village near here this morning. No loss of life was reported. The families could not save their household goods. According to Manali Subdivisional Magistrate Balbir Thakur, the total loss was estimated at Rs 30 lakh. The three-and-a-half-storey house was reduced to ashes, he said. The families affected were provided Rs 35,000 as immediate relief and rations for one month. The house belonged to Ram Chand, Kishan Chand and Neel Chand. According to sources, fire broke out in the wee hours. Local villagers used agricultural spray pumps to check the spread of fire to adjoining houses. Sub Divisional Police Officer Dinesh Kumar Sharma said the police stopped the truck carrying 105 wooden logs of willow trees at a naka near Tanda. It was alleged that the logs were being carried without a valid permit or a bill to Punjab for manufacturing cricket bats. This kendra, equipped with the latest e-technology, will prove helpful to tax payers of the northern region of the state. Speaking on the occasion, Dr Sudha said so far 135 ASKs had been made functional in the country. She said under a “citizen charter programme” launched by Prime Minister Manmohan Singh, the Income Tax Department had taken an initiative to set up such institutions across the country with an object to solve the day-to-day issues being faced by tax payers during the e-filing of returns, getting refunds and processing of rectification applications. She said in 2010, the first year, only 15 such kendras were opened and this year the number had reached 135. Dr Sudha said the Income Tax Department was well conversant with the issues of tax payers, therefore, it had come out with a time-bound plan to meet their grievances. She said refunds were being issued within a period of 47 days, in the next year, it would be reduced to 30 days as the department had set up a new system in Central Processing Centre, Bangalore, to speed up the processing of returns. She appealed tax payers to switch over to e-filing of their returns that would not only help them to get their refunds on time but it would also reduce the work load of the department. She added that a new central processing centre would be set up in Gurgaon in January 2013, which would only deal with the processing of TDS returns of the country. Gurpreet Singh Chief Commissioner, Income Tax, Shimla, and Romesh Chand, Commissioner, Income Tax, also spoke. Kamal Sharma, an IAS officer, was at present posted as Managing Director, Himachal Pradesh Electronics Development Corporation. While Rakesh Sharma was serving as Special Secretary, Horticulture, and Controller, Printing and Stationery. Both officers had served in the Chief Minister’s Office even during the last stint of Virbhadra Singh from 2003 to 2007.